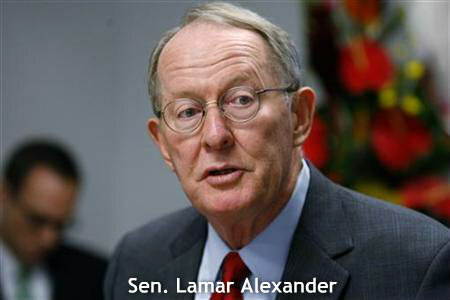 Senator Lamar Alexander has 2 balls and 1 brain! The right stuff in the proper proportions! Madam President, there are reports in some of the newspapers this morning that there is an effort to try to slip into the negotiation about extending the payroll tax break for the next year a big loophole for the rich and for the investment bankers and for most of the people President Obama keeps talking about as people whose taxes he would like to raise. What I mean by this is I have heard there may be an effort to put into the payroll tax agreement a four-year extension of the so-called production tax credit, which is a big tax break for wind developers. I cannot think of anything that would derail more rapidly the consensus that is developing about extending the payroll tax deduction than to do such a thing. We are supposed to be talking about reducing taxes for working people. This would maintain a big loophole for investment bankers, for the very wealthy, and for big corporations. We hear a lot of talk about federal subsidies for Big Oil. I would like to take a moment to talk about federal subsidies for Big Wind — $27 billion over 10 years. That is the amount of Federal taxpayer dollars between 2007 and 2016, according to the Joint Tax Committee, that taxpayers will have given to wind developers across our country. This subsidy comes in the form of a production tax credit, renewable energy bonds, investment tax credits, federal grants, and accelerated appreciation. These are huge subsidies. The production tax credit itself has been there for 20 years. It was a temporary tax break put in the law in 1992. And what do we get in return for these billions of dollars of subsidies? We get a puny amount of unreliable electricity that arrives disproportionately at night when we don’t need it. Residents in community after community across America are finding out that these are not your grandma’s windmills. These gigantic turbines, which look so pleasant on the television ads — paid for by the people who are getting all the tax breaks — look like an elephant when they are in your backyard. In fact, they are much bigger than an elephant. They are three times as tall as the sky boxes at Neyland Stadium, the University of Tennessee football stadium in Knoxville. They are taller than the Statue of Liberty. The blades are as wide as a football field is long, and you can see the blinking lights that are on top of these windmills for 20 miles. In town after town, Americans are complaining about the noise and disturbance that come from these giant wind turbines in their backyards. There is a new movie that was reviewed in the New York Times in the last few days called “Windfall” about residents in upstate New York who are upset and have left their homes because of the arrival of these big wind turbines. The great American West, which conservationists for a century have sought to protect, has become littered with these giant towers. Boone Pickens, an advocate of wind power, says he doesn’t want them on his own ranch because they are ugly. Senators Kerry, Kennedy, Warner, and Scott Brown have all complained about the new Manhattan Island-sized wind development which will forever change the landscape off the coast of Nantucket Island. On top of all that, these giant turbines have become a Cuisinart in the sky for birds. Federal law protects the American Eagle and migratory birds. In 2009, Exxon had to pay $600,000 in fines when oil developments harmed these protected birds. But the federal government so far has refused to apply the same federal law to Big Wind that applies to Big Oil, even though chopping up an eagle in a wind turbine couldn’t be any better than its landing and dying on an oil slick. And wind turbines kill over 400,000 birds every year. We have had some experience with the reliability of this kind of wind power in the Tennessee Valley Authority region. A few years ago TVA built 30 big wind turbines on top of Buffalo Mountain. In the eastern United States, onshore wind power only works when the wind turbines are placed on the ridge lines of Americas most scenic mountains. So you will see them along the areas near the Appalachian Trail through the mountains of scenic views we prize in our State. But there they are, 30 big wind turbines to see whether they would work. Here is what happened: The wind blows 19 percent of the time. According to TVA’s own estimates, it is reliable 12 percent of the time. So TVA signed a contract to spend $60 million to produce 6 megawatts of wind — actual production of wind — over that 10-year period of time. It was a commercial failure. There are obviously better alternatives to this. First, there is nuclear power. We wouldn’t think of going to war in sailboats if nuclear-powered submarines and aircraft carriers were available. The energy equivalent of going to war in sailboats is trying to produce enough clean energy for the United States of America with windmills. The United States uses 25 percent of all the electricity in the world. It needs to be clean, reliable electricity that we can afford. Twenty percent of the electricity that we use today is nuclear power. Nearly 70 percent of the clean electricity, the pollution-free electricity that we use today is nuclear power. It comes from 104 reactors located at 65 sites. Each reactor consumes about one square-mile of land. Think about it another way. Four reactors on four square miles is equal to a row of 50-story tall wind turbines along the entire 2,178-mile Appalachian Trail. Of course, if we had the turbines, we would still need the nuclear plants or the gas plants or the coal plants because we would like our computers to work and our lights to be on when the wind doesn’t blow, and we can’t store the electricity. Taxpayers should be the ones on pins and needles. This $27 billion over 10 years is a waste of money. It could be used for energy research. It could be used to reduce the debt. Let’s start with the $12 billion over that 10 years that went for the production tax credit. That tax credit was supposed to be temporary in 1992. So let’s not even think about putting this tax break for the rich in the middle of an extension of a tax deduction for working Americans this week. Let’s focus on reducing the debt, increasing expenditure for research, and getting rid of the subsidies. Twenty years is long enough for a wind production tax credit for what our distinguished Nobel Prize-winning Secretary of Energy says is a mature technology.